A gangster hat is typically a fedora. Fedoras have been worn in the United States for decades and usually feature a sharp brim at the back and a slightly rounded brim at the front. The top of a fedora is usually shaped like a puffed-out circle and sometimes has a ribbon circling it. Making your own gangster fedora hat out of paper requires basic materials and attention to the design of a typical fedora. Fold your construction paper almost in half lengthwise. Leave about 1 inch between the end of your top fold and the bottom edge of your paper. Take the top left corner and fold it until it lies in the middle of your paper and forms a triangle wedge sloping downward and to the left. Take the top right corner and fold it until it lies in the middle of the paper and makes a triangle wedge sloping downward and to the right. Both of your folds should lie right next to each other in the middle of your paper, and their wedges should run away from each other in opposite directions. You should also have about 2 inches between where you just made your folds and the bottom of your construction paper. 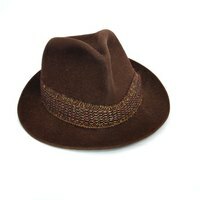 Fold in the paper edge sitting right below the triangles to form half of the brim of your fedora. Take the rest of the paper sitting below the half-brim and fold it backward over the other side of the hat to form the other half of its brim. Cut this brim half down to the size of the other one using your scissors. You now have the basic shape of a paper fedora gangster hat. Fluff out the inside of the hat with your hand so it looks like a puffy circle. Glue the brims down around the hat's outside puffy circle. Once the glue is dry, your hat is finished. Your construction paper may need to be larger or smaller depending on the size of the head you are making the hat for.